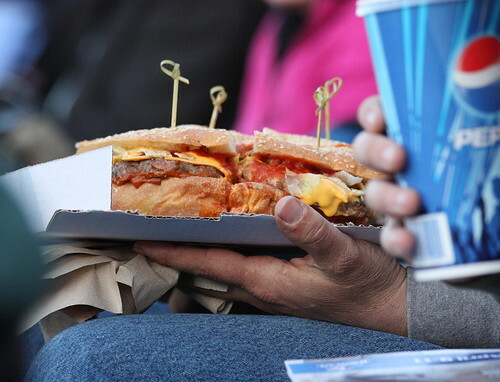 I know a lot of you are familiar with the story of the Fifth Third Burger.It’s a 5,000 calorie monstrosity created by the West Michigan Whitecaps that’s filled with meat, five slices of American cheese, chili, salsa, nacho cheese and Fritos. There may also be half a horse in there too. But anyway, the burger officially made its debut this week, with the Whitecaps having an Opening Day challenge to see who could eat the whole thing by themselves. 32 brave souls attempted to do it. Only 17 managed to survive accomplish the feat. A 16-year-old kid, Steve Landis, managed to be the first to finish. And his mom provided possibly the quote of the year for us. Are you kidding me? Anyone who finishes a burger of this size deserves not just our admiration, but a bronze statue.